A COMMENT by Kilks on my entry that appeared in the Planet Naga blog aggregator tickled my interest; following the lead, I checked the Avions de Transport Regional (ATR) website and found that its press statement on the deal with Cebu Pacific -- which also appeared on the latter's website -- contained two pictures with it. 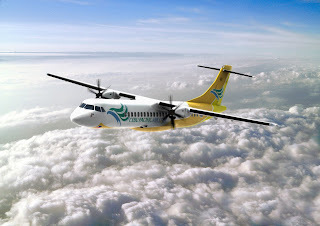 One depicts how the ATR 72-500 donning Cebu Pacific's all-too familiar livery will look like. Incidentally, the paper version of last week's Bicol Mail carried the same picture in the inside pages. I can't wait to see them become a fixture of local skies. And listening to Tourism Regional Director Maria Ravanilla's interview over DWNX this morning, there is all the more reason for Cebu Pacific to enter the Naga market. Citing statistics on domestic and foreign tourist arrivals for January-March 2007, a total of 168,548 tourists visited Bicol, an increase of 37% over last year's 123,364 over the same period. And again, Naga/Camarines Sur again led the other provinces. I failed to take down the provincial breakdowns, but the main draw, of course, is the Camarines Sur Watersports Complex, supported by Naga's tourism-related services, headlined by our Magsaysay Strip, especially the Avenue Square area. Which all the more underlines the need for greater collaborative work between the provincial and city governments, a thesis I advanced here.